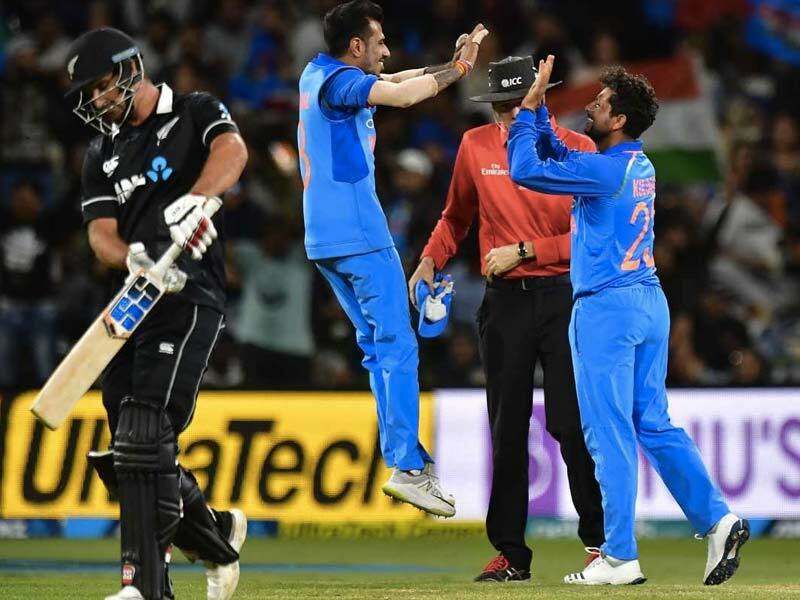 After having won the first match quite comfortably, India dominated the second ODI at Mount Maunganui too after defeating the Black Caps by a handsome 90 runs. Rohit Sharma was the pick of the batsmen in the game scoring 87 runs as India posted 324/4 in their allotted 50 overs. In response, the New Zealand batsmen were bundled out for 234 with Kuldeep Yadav picking up 4 wickets. This 90 runs win was also the biggest winning margin against New Zealand by India. Having won the toss, Indian captain Virat Kohli decided to bat first on a pitch that was a bit on a slower side. The Indian openers laid a solid foundation with a solid 154-runs partnership before Shikhar Dhawan was a dismissed for a well-made 66 off a thick edge of Trent Boult’s delivery. Soon Rohit Sharma was also dismissed off Lockie Ferguson’s delivery thus missing out on his 23rd ODI hundred. However, a collective batting display by Virat Kohli 43, Ambati Rayudu 47 and a blistering knock of 48* off 33 deliveries by MS Dhoni and Kedar Jadhav’s 22* off 10 balls helped India post a total of 324 runs for the loss of 4 wickets in 50 overs. The score was just a par total on the ground and could have been easily achieved by New Zealand, however, the Kiwis lost both Martin Guptill and Kane Williamson inside the first powerplay overs. Further, the Indians managed to send Colin Munro and Ross Taylor back to the pavilion as New Zealand were reduced to 100/4 inside 17 overs. Tom Latham was the next player to be dismissed after he was adjudged LBW off Kuldeep Yadav’s delivery. A flurry of wickets tumbled for the Kiwis soon after as they were reduced to 166/8 inside overs. A fine counter-attacking innings by Kiwi all-rounder Doug Bracewell then managed to salvage some pride for the Kiwis as he took the Black Caps total to 224 before perishing after scoring 57 off Bhuvneshwar Kumar’s delivery. The last wicket was picked up by Yuzvendra Chahal who dismissed Lockie Ferguson to handover India a double advantage before the 3rd ODI that is to be played in the same venue. Kuldeep Yadav was the pick of the Indian bowlers as he picked up 4 wickets, and was ably supported by Yuzvendra Chahal and Bhuvneshwar Kumar who picked up 2 wickets each. The 3rd ODI of the series is to be played at the same venue and it would be interesting to see whether India can wrap-up the series in the same match or will they face stiff resistance by the Kiwi players.